Edward Hopper originally trained as an illustrator but then focused on painting between 1901 to 1906 under the watch of Robert Henri, from the Ashcan school. After that he travelled to Europe three times, but wasn’t influenced by the experimental art blossoming in France at the time and instead took his own path. He didn’t really do a lot of painting until 1924, instead working on illustrative etchings and advertisement art. When he began painting, he focused on urban images, like many members of the Ashcan school, but instead of the organized, clean paintings common to the Ashcan school they instead showed still, anonymous figures that create a feeling of loneliness. At this point, his view mature style was already formed. Edward Hopper was one of the most famous and influential American realists of the 20th century. He painted in rich colors and stark lights, and employed light, color planes, and large vertical and horizontal angles. He visited Europe multiple times, but the only thing that really influenced was their use of light, which is one of the most important elements of his work. He was virtually unknown as a painter until the late 1920’s after his exhibition at the Armory show was unsuccessful. He is mostly known for magazine cover he designed at this time. 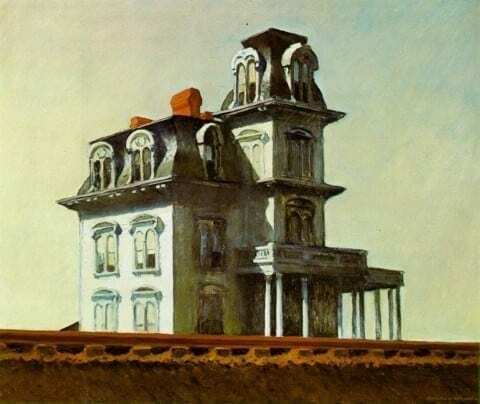 His return to painting was in 1925, with A House by the Railroad, which is an excellent example of his style with loneliness, isolation, and occasional sadness. By keeping to this style, he became one of the most famous American artists of the 20th century. The Great American Artist Edward Hopper (3) by Jacob is licensed under a Creative Commons Attribution-ShareAlike 4.0 International License.